View More In Platforms & Wedges. 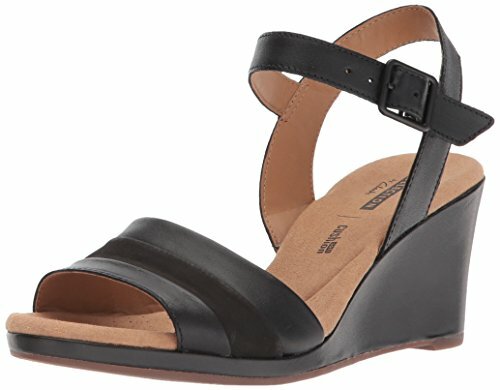 This stylish wedge sandal from Clarks Collection is crafted of soft leather uppers with a leather-wrapped cork bottom. The Lafley Aletha features an adjustable buckled ankle strap, Ortholite foot bed with Cushion Soft technology, and a flexible rubber outsole that adds a level of comfort to last throughout the day. Its flattering mid-heel height and two strap design works well with a variety of casual and dressy outfits while providing extreme walkability. If you have any questions about this product by CLARKS, contact us by completing and submitting the form below. If you are looking for a specif part number, please include it with your message.